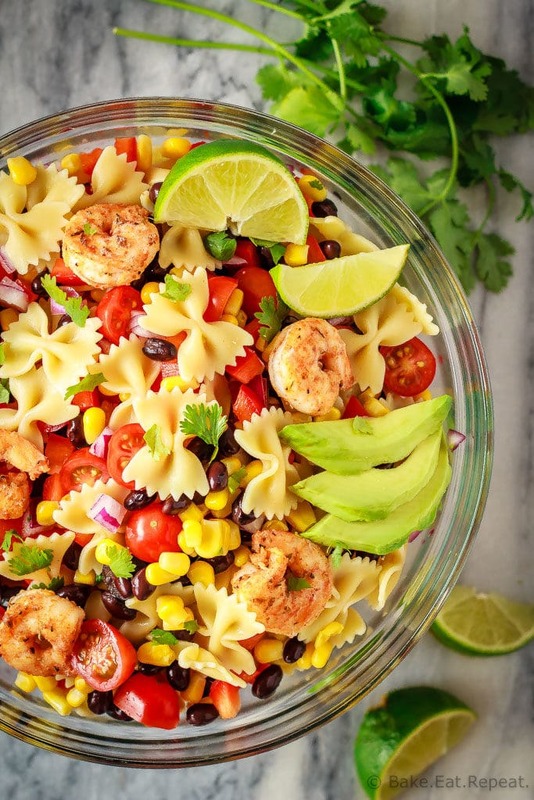 This Mexican pasta salad with Cajun shrimp is perfect for summer – easy to make, the whole family will love it, and it can even be made ahead of time! Thank you to Barilla Canada for sponsoring this post. Mexican food is a real favourite at my house. If you’ve been reading for any amount of time you probably already know this. I’m pretty sure that I share more Mexican flavoured recipes than anything else. It’s just always my first idea when faced with the question of what to make for supper. Tacos or pasta. That’s always the answer. Without fail. Easy, delicious and everyone is happy. So when I can put those two things together, I know that supper will be amazing. Combining two favourites is always a good idea. This Mexican One Pan Pasta and this Mexican Baked Pasta are both go-to meals here when I’m scrambling to get dinner together at 5 o’clock, so it was really only a matter of time before a summer-y version happened! 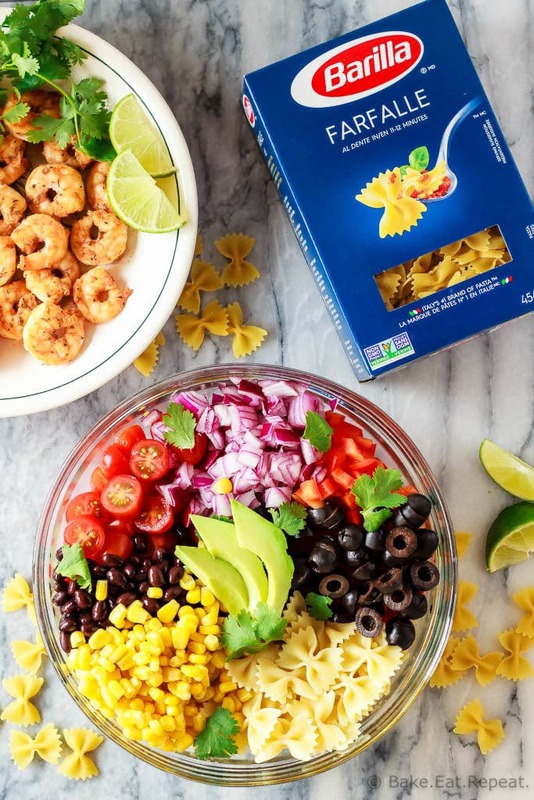 This Mexican pasta salad with Cajun shrimp is the answer to your “what should I make for dinner” question. 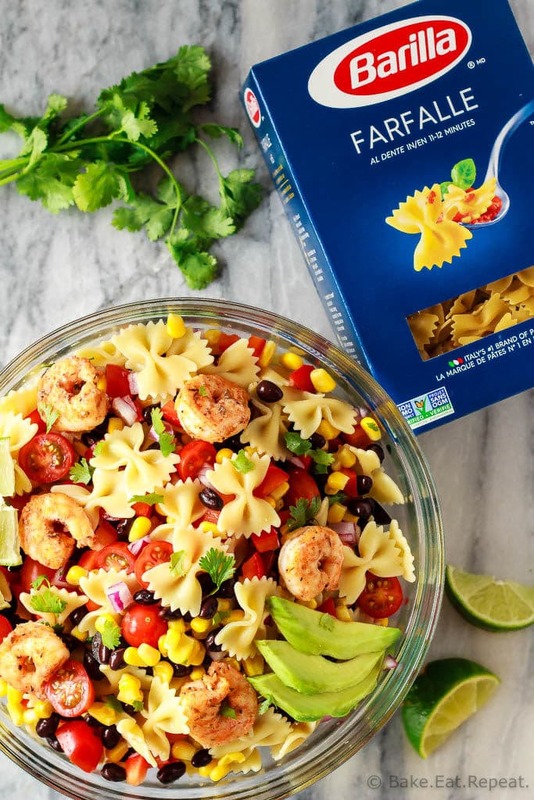 Fast, easy, filled with fresh veggies and tasty Barilla farfalle pasta – it’s the perfect summer meal. Or side dish if you want – it can easily be made ahead to bring to a BBQ. And the best part is how customizable this meal is. Make it your way by changing up the veggies, take out any ingredients you don’t like, make your shrimp plain instead of cajun. Barilla pasta can be made your way to suit the tastes of your family. 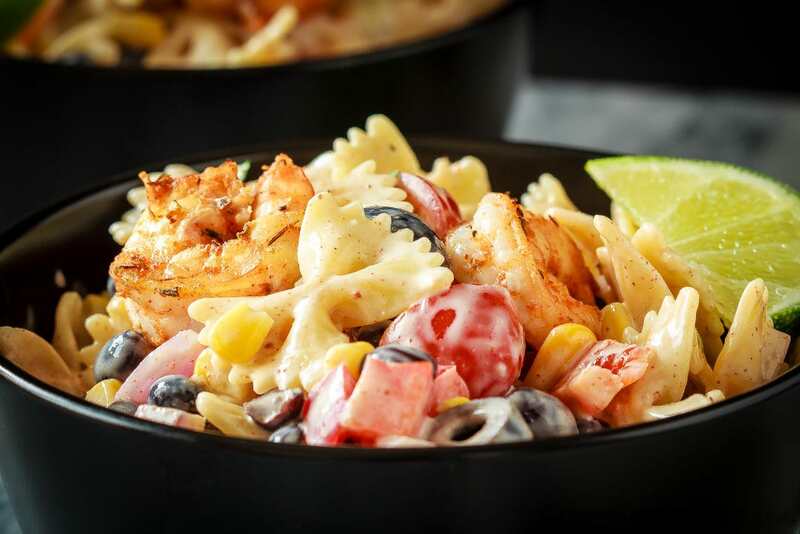 In fact, when I make this Mexican pasta salad, the black beans only get added to my plate because everyone else is crazy, and the kids enjoy their shrimp plain instead of spiced up with Cajun seasoning. Simple ways to customize everyone’s meal that take no time at all, but make for a happier family. Visit Barilla.ca to find more great recipes for quick and easy family friendly pasta meals! 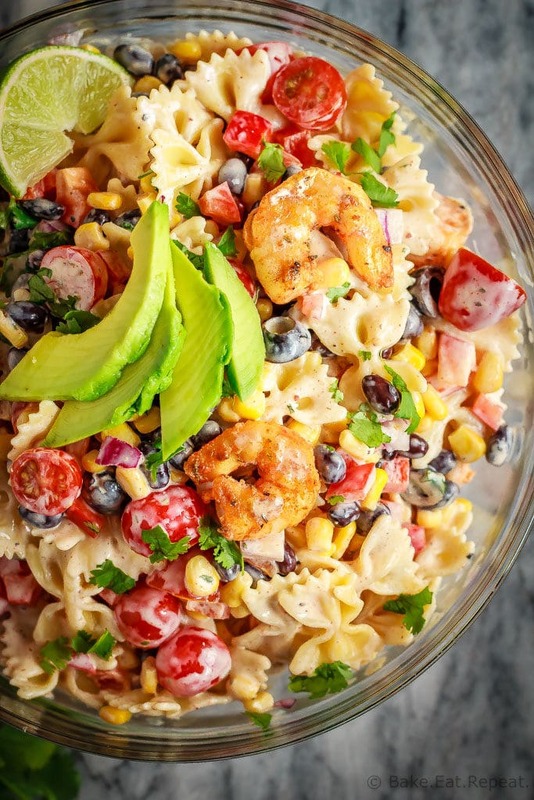 This Mexican pasta salad with cajun shrimp is perfect for summer - easy to make, the whole family will love it, and it can even be made ahead of time! Heat a non-stick skillet over medium heat. Toss the shrimp with the olive oil and the cajun seasoning. Add the shrimp to the skillet and cook for about 6 minutes, flipping once, until they are completely pink. Set aside. In a small bowl, whisk together the sour cream, mayonnaise, Ranch seasoning and taco seasoning until well combined. Set aside. Cook the pasta to al dente, according to the package directions, in a large pot of boiling water. Drain and rinse with cold water until the pasta has cooled. Place the pasta in a large bowl and add the corn, red pepper, tomatoes, black olives, black beans, red onion, cilantro, avocado and shrimp. Add the dressing (you may not need all of it) and toss lightly until everything is coated. Alternatively, you can refrigerate the salad, shrimp and dressing separately if you are making it ahead of time, and toss it all together right before serving. Don’t cut and add the avocado until right before serving as it will brown quickly. If you are making this ahead of time, keep the salad components, the dressing, and the shrimp separate until right before serving. Also, don’t cut and add the avocado until right before serving as it will brown quickly. This is such a beautiful dish, and the flavor combos sound out of this world. I can't wait to make it! Holy WOW! This looks amazing! Making this for dinner soon! I am a sucker for cajun! I must make this!! Barilla is always my go-to pasta and I love anything with Mexican or Cajun flavors! I love that you added shrimp to this easy salad. We adore mexican dishes and they're always an easy one for everyone in the household to gobble down. This is definitely going on the meal plan for this weekend, thank you! We have Mexican food at least once a week, so this would be a definite winner in my house! We love Mexican, too...AND pasta! I love this colorful dish! Also love the spice of the Cajun shrimp. Look forward to giving this one a try!